NASA scientists have released a boatload of data from OSIRIS-REx, the spacecraft orbiting the asteroid Bennu. There are lots of interesting results—and some potential unforeseen challenges when it comes to collecting a sample. The results published today in various Nature journals include a whole lot of surprising and exciting findings. Bennu seems to be rife with water-containing, or “hydrated,” minerals. It’s an active asteroid, spewing debris into space 11 times during the course of observations so far. It’s also craggier than previously thought, which will make collecting a sample difficult. NASA scientists are up to the challenge, though. 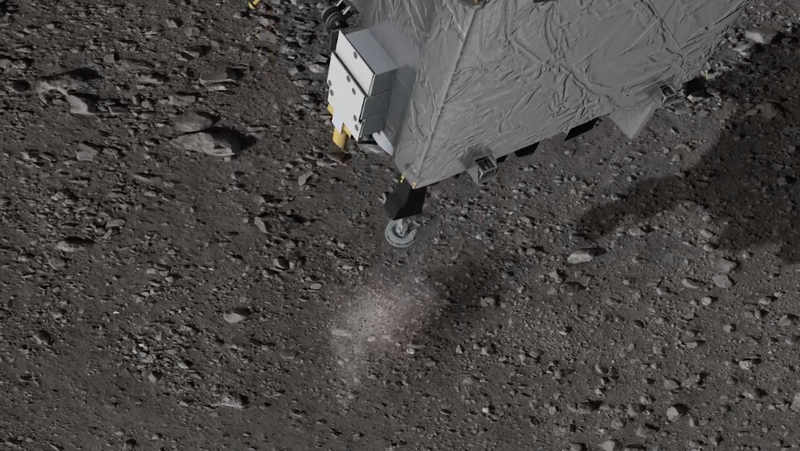 “We feel confident that our systems and teams are up to the task of [touch-and-go-sampling] a collection site that was smaller than previously,” Rich Burns, OSIRIS-REx project manager, said during a NASA media conference. NASA launched OSIRIS-REx, the Origins, Spectral Interpretation, Resource Identification, and Security – Regolith Explorer, in 2016 to characterize and collect a sample from Bennu, an asteroid that may be hazardous to Earth one day in the future. It arrived in orbit in December 2018, and is scheduled to return with a sample in September 2023. Like Ryugu, another asteroid humans are currently trying to sample, Bennu looks like a spinning pile of rubble, compressed into a top-like shape. Imaging of its absorbed radiation reveal that Bennu looks most like carbon-based meteorites called carbonaceous chondrites. But unlike the similar asteroid Ryugu, Bennu appears to be full of water-containing minerals. The new data also indicates that Bennu’s rotation is slowly speeding up, thanks to solar energy striking only one side of the asteroid, and that its interior contains a mix of dense spots and voids which, combined with its spin, might impact its surface topography. Dante Lauretta, OSIRIS-REx principal investigator from the University of Arizona, Tucson, and Coralie Adam, OSIRIS-REx flight navigator from KinetX, Inc. Space Navigation and Flight Dynamics, also explained that it’s an active asteroid, meaning it regularly ejects material into space. Perhaps most importantly, Bennu’s surface features rocks of a variety of sizes—everything from large boulders to tiny grains. This, combined with measurements of its impact craters, implies that Bennu is between 100 million and 1 billion years old, older than previously thought. It’s even possible that its surface bears traces of the time Bennu spent in the asteroid belt before arriving in its present-day orbit, which intersects the orbits of both Earth and Mars. Those heterogeneously sized rocks could prove problematic to the mission, however. OSIRIS-REx has an instrument called the Touch-and-Go Sample Acquisition Mechanism (TAGSAM), which is an arm that extends toward Bennu. The probe will shoot nitrogen gas at the asteroid to kick up rock and then collect it in a container attached to the arm. The system won’t be able to kick up and capture a large boulder, though. That means that instead of being alright with any spot within the 25-meter radius, the flight navigators will need to try and hit the center of it. It’s as if rather than just hoping a dart hits the dartboard, they must attempt to hit the bullseye, said Burns. The wealth of scientific data Bennu is offering makes OSIRIS-REx researchers eager to approach the asteroid and snag a sample. Neyda Abreu, associate professor of geoscience and mathematics from Penn State DuBois who was not involved in the new studies, told Gizmodo that she was excited by the potential discovery of magnetite, a rock that can be indicative of the presence of water. And she was “at the edge of her seat” thinking about whether the sample would contain organic molecules, and if so, what kind. OSIRIS-REx scientists are hard at work ensuring that they fully understand all the risks facing them as they prepare to touch down on Bennu. If all goes according to plan, we can expect the sample collection to take place during the summer of 2020, said Lauretta.